One month every year, five highly competitive friends hit the ground running in a no-holds-barred game of tag they've been playing since the first grade - risking their necks, their jobs and their relationships to take each other down with the battle cry "You're It!" This year, the game coincides with the wedding of their only undefeated player, which should finally make him an easy target. But he knows they're coming... and he's ready. 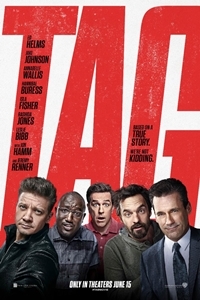 Based on a true story, "Tag" shows how far some guys will go to be the last man standing.